The papers for the 1st Investment and Programme Cttee panel meeting are now up. It includes a paper giving an update on the procurement of new DLR Rolling Stock. The scope is 43 new "walk through" trains - 33 for straight fleet replacement and 10 for growth. Depot modifications at Beckton are also needed. 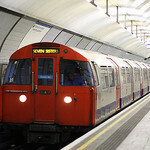 Seems the B90/92 trains are at the end of their life and are suffering serious defects with poor levels of reliability. There would also be further contract options for more trains to cater for further demand growth / extension to Thamesmead. First new train would arrive in 2022 and last in 2024. Looking at the risk section it seems the possibility of decking over part of Beckton depot is being considered and there may be a combined DLR and bus depot there! Interestingly TfL are proposing the use of a finance lease to defer the capital cost impact of the new trains until the next business plan period. There is also an interesting Appendix 3 to the paper showing possible service expansion options and the numbers of extra trains required. Interesting to read that they are looking to change from three two-car units coupled to form a train to one six-car unit. Not sure what you mean? They already run 6 car trains, just in 3x2 formation. The paper makes clear that DLR wish to purchase trains that are "walk through" in design but 6 cars long. Therefore you would have a single train that is equivalent in length to 3 x 2 car units but without the intermediate car ends and couplings. The paper also makes clear that the future trains would have the same kinematic envelope as existing stock and would need to be as "flexible" as current stock in terms of coping with the curves and gradients that the existing stock copes with. Clearly the future trains will have more space inside and will allow people to spread along the train. It also means it is more likely that all services in future will be run with the equivalent of 3 car trains today. As the current fleet is constrained there is a mix of 2 and 3 unit workings. That is probably not sustainable in future if the anticipated growth materialises - especially on the Stratford - Woolwich and Beckton branches. For me, the fact that it runs above 25 mph makes it much less of a light railway. Tyne & Wear Metro is also blurred, especially as the Sunderland section runs on Network Rail and shares these tracks with mainline trains. Then again, the surviving section of the Callington branch to Gunnislake is little changed today from its light railway days. The paper mentions that part of the problems with the current fleet is the need to remove the centre unit from a train when it becomes due for maintenance and how this frequent coupling/uncoupling is leading to further units having to be removed from traffic for repairs. They are shifting to fewer longer units rather than the current many short units. I'm pretty sure TfL refers to each articulated DLR unit as a 'car' thus meaning that each train is currently formed of only 3 cars, not six. @nnan correct. The platform extension works a few years ago were the "3-car Capacity Enhancement Project", and the stopping marks at the stations are labelled 1, 2 and 3. Which is why I used the term "unit" to avoid confusion. They are changing from trains made of three units coupled to one unit of similar length to three units coupled. Last Edit: Mar 3, 2017 12:48:10 GMT by rincew1nd: Of, not if. Docklands Light Railway currently runs with a mixed fleet of 149 Light Rail Vehicles (LRVs)1 supplied by Bombardier. The specification for the LRVs is based on the original concept for the DLR, a light railway, carrying 1,000 passengers per hour in single 28 metre long LRVs. The network now carries over 115 million passengers per year and demand is predicted to grow considerably. 1 A single Light Rail Vehicle (LRV) on the DLR is made up of a 28 metre long articulated vehicle. These are operated as two (56 metre long) or three (84 metre long) LRV consists. Quoting the original specifications in passengers per hour, but the current ridership in passengers per year is really annoying me! Could kind soul convert one to the other to make the comparison easy for those of us who are not mathematically inclined. Allowing for five non-traffic hours, the conversion factor is roughly 7000. Being a tiny bit more precise (well as much as you can with such poor data) than the Flyer from Kingston the original system's theoretical capacity was around 6.9m pass per year. Looking at Government official stats the first recorded year's patronage (88/89) was 6.6m pass jnys. There has been a steady rise in patronage barring some blips in the early 1990s but that was because the system was being rebuilt and extended to Bank. The system was shut for endless weekends and in the evenings. Unsurprisingly the cross river extensions have driven large increases in patronage. Desperately trying to buy foreign trains before we don't have to!